How to use vanity phone numbers for successful advertising. Although these are overarching figures, your audience must exist in some, if not all, of these mediums. You only use these channels because of the reach and audience they provide. More research has to be done to determine where your target audience goes and where they spend their time. Sometimes that means that your audience is able to be reached and influenced best by a radio, podcast, or television advertisement. Every brand is trying to get as many interactions as possible with their target audience because results have proven that on average, it only takes so many interactions before someone becomes a customer. Radio, podcasts, and television are channels that are able to reach people where internet and other popular forms of advertising cannot. Not everyone has internet, not everyone has a smart phone, and those limitations make it difficult for you to reach your target audience. What matters is how much reaching that audience is worth because radio, podcast, and television have variable influence. Radio, podcasts, and television are still popular channels for some industries because their products or services are well established. Some brands have deep enough pockets that they have maxed out their other channels and so radio, podcasts, and television ads are the next logical step. The key aspect of those channels is that you get your 15 or 30 seconds (or longer) to sell your brand, service, or product to the listener. You can influence potential consumers by using your advertisement like an “Elevator Pitch” to convince them. Celebrities, thought-leaders, and catchy sounds can give you an edge over other channels. Few, if any brands, use radio, podcasts, or television channels exclusively. The reason that those channels are difficult to track comes down to the fact that brands use them in conjunction with other channels. Brands pair the radio ad, podcast ad, or television commercial along with dozens of other advertising channels. Multi-channel advertising to reach your audience wherever they go is now considered the norm. Television commercials have made history for how expensive they can be (such as first quarter Super Bowl ads). As spend increases on advertisements, so does the need to track the results. Radio and television media sellers can often provide the hours that your advertisement runs. If you know the hours that your advertisement will be used they you could theoretically plot some of the lift based on the type of traffic your website is getting. Assuming that someone who hears or watches your advertisement goes online to find your brand (soon after). This is the logic behind the tracking system that NBC was developing in the article noted above. 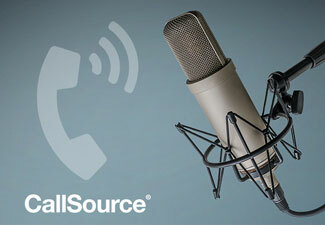 CallSource has helped clients become very successful with radio, podcast, and television advertisements (as well as others) using call tracking. The idea is placing unique phone numbers across your advertisements and then using our analytics to easily display the results over time – by channel, ad, and source. Although brands have been able to source the calls, there was concern about the ability of consumers to remember and write down the number. Clients who feel that their phone numbers are not memorable enough or not easily dialed are recommended to switch to Vanity Toll-Free phone numbers. The key difference for Vanity Numbers is the ease of remembering, dialing, and writing down the numbers. When it comes to radio, podcasts, or television advertisements, the Vanity Number is king both in being able to track the call for lift and being memorable. There are two types of Vanity Numbers and three types of coverage when it comes to finding the right Vanity Number. Phone numbers that spell a word, phrase, or brand are called alphanumeric phone numbers (we also call them spellers). Alpha Vanity Numbers are readable and can be spoken where they do not look like a phone number. Alpha Vanity Numbers have been around long enough that everyone has figured out how to dial them. Since they do require some thought in the dialing process, they tend to be used where the purpose of displaying them is to reinforce branding. Consumers remember phone numbers when there is an element of the brand associated with the number. Even if you do not know immediately how to dial (1-800-FLOWERS) you will likely have an easier time remembering that than its digits (1-800-356-9377). This is even more relevant when it comes to advertisements that have seconds to display or speak the phone number (Radio, Podcasts, and Television advertisements). Phone numbers that repeat digits are called repeater phone numbers. Repeater Vanity Numbers rarely double as Alphas – but they achieve a similar end. Repeaters are the easiest to dial because you will only be dialing a few digits. Repeaters can be easy to write down and can be quickly remembered following an advertisement. Some brands use repeaters by incorporating them into a jingle due to the repetition of the digits. An advertisement that uses (800-800-7000) can feel confident in the consumer remembering and dialing the phone number because of the simplicity of the number. While repeaters do not stand out as much compared to alpha Vanity Numbers, they are much easier to dial and can be very relevant depending on the type of advertisement channel. Am I losing customers to competition? Are my consumers shopping around for my products or services? Does my competition focus on branding? Do I feel that branding is a small problem compared to other issues I’m dealing with? First, if you know you are losing customers to your competition, consider branding your company, products, or services with a Vanity Number. It’s hard to be #1 in a lot of industries but once you are there it takes work, luck, and smart business decision to stay there. Reaching #1 requires a tactical approach to winning both in brand and in customer value. Second, if you know that your consumers are price shopping you and comparing your products and services to competitors, then consider branding. Products and services only sell themselves up to a point. There is a portion of every audience willing to try new things and they accept more risk. However, usually the largest and most valuable customers for a business come from those who prize the brand, professionalism, culture, and experience you offer above the products and services themselves. Do they have a Vanity Number? Are they advertising in Radio, Podcasts, or Television? Branding is usually pretty easy to detect, but you could always survey an audience to get deeper insights before you commit to changes. Being customer-centered based on the feedback of your best customers is always an important aspect to any business. Fourth, and finally – maybe you feel that branding is low on the list of your priorities. You have employees to correct, processes to refine, and business decisions to make that take precedence over branding that you feel will move the needle more than a simple number change. You may even feel that if someone wants to dial your number, they will, so why track it or why slap a memorable mask over it? Although you know your business best, our insights have proven to us and thousands of businesses across dozens of industries that a Vanity Number works (and works well). We have seen businesses make the simple change and watched as inbound calls came in with higher quality callers and better customers. A Vanity Number is a simple way to position yourself as a higher quality brand and can make the difference in sales with very little effort. Media Buying – Find the right outlet for your advertisement. For radio: what languages, what station(s), where geographically, time of day, day of week, who will say it, etc.. For podcasts, which ones, and how it can be delivered (who will say it). For television, what channel, how long, and what you will showcase. Stand Out – You must be able to get your target audience’s attention and hold it long enough to remember the idea of the advertisement and the call to action you want them to perform (calling your Vanity Number). Influence – You have to be able to persuade someone by disrupting your audience from what they intended to do, and instead have them perform the call to action you want them to take. The more engaging your advertisement is that also leads them to want to take action to fix or solve their problem (that you can solve), the better the advertisement. The Call to Action – Effectively communicate the action you want your audience to take. Make sure your advertisement is relevant to the audience that you are targeting (do the research). Consider a survey, pre-launch, to get initial feedback that can help you make the best advertisement possible. Maximize the media spend you have by testing, testing, testing! Consider trying to spread your budget and being efficient with your spend in the Radio, Podcast, and Television channels. Competitors can give you a lot of information if they are already advertising and how they are doing it. Look at their ads and their ideas and try to make for a better experience. Ready to choose the perfect vanity number for your radio, TV, or podcast ad? Search for your vanity number here or talk to a specialist at 855-GOT-VANITY.